His face probably won’t escape notice. A convicted bank robber who also committed an assault in prison went missing from a halfway house in Manchester, N.H. on Monday night, and authorities in the state are trying to locate him. A mugshot of Eric Judkins, 42, provided by the US Marshals suggests that the violent felon will stick out in a crowd. Judkins’s face, head, and neck are covered in tattoos, including the phrase “Boot Boy” scrawled above his upper lip. 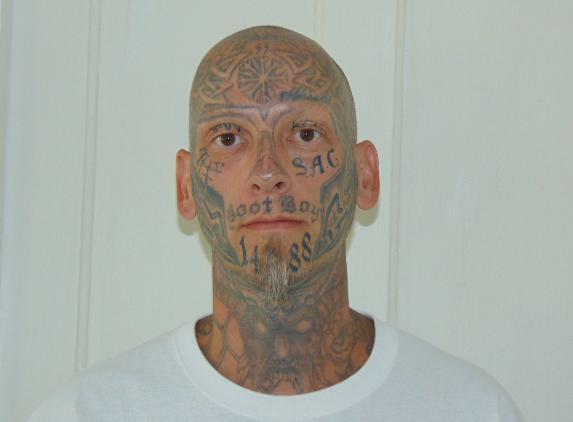 His “extensive array of tattoos” also includes ones on his chest, arm, and hands, the marshals said. Judkins stands 5-foot-10 and weighs 160 pounds, with brown eyes and a shaved head. The marshals said he has a history of violence and should not be approached. His friends, relatives, and associates live in the Manchester and Nashua areas, but his current whereabouts are unknown, the statement said. Anyone who knows where he may be hiding should call Deputy US Marshal Brandon Wilson at 603-225-1632. In the alternative, authorities said, Judkins could end the search himself by simply facing the music.